I wrote a fantastic introduction to this review, telling about my visit many years ago to a certain governmental agency to discuss job opportunities. But as I was rereading the intro (and patting myself on the back for a job well done), I had a vague recollection that, prior to that visit, I might have signed some sort of confidentiality agreement. So, in the interest of self-preservation, I decided it would be prudent to erase the entire magical introduction. Emily Ruff is sixteen, homeless, and a whiz at Three-Card Monte. She is swindling people with her sleight of hand and her witty banter when she is recruited by “the organization.” After being flown first-class to a super-secret location and undergoing a number of weird tests, Emily is accepted to the organization’s super-secret school. The school finds and accepts students who are predisposed both to be persuasive and avoid persuasion. It gives them rigorous training on how to control people using only words. The school teaches its students to determine a person’s personality type (“segment”) by observing her mannerisms, word choices, and behaviors. Asking simple questions (“Are you a cat person or a dog person?” and “What is your favorite color?” and “Do you love your family?”) helps narrow down the person’s segment even quicker. And, once a student figures out a person’s segment, she knows the exact words to make that person putty in her hands, susceptible not just to suggestion but to commands. When a student graduates, she becomes a poet (because poets are “good with words”) and works for the organization. It is unclear whether the organization is a governmental entity, but it has global ties. It is also unclear what the organization does, aside from running the school and performing a lot of evil experiments to see just how powerful words can be. But the organization is run by the villainous Yeats, and you get the idea that it’s not completely on the up and up. The discovery and subsequent creepy, horrible, terrible, malicious use of one such baseword is what drives the book’s action. The story is told from two perspectives: one follows Emily from her initial recruitment by the organization, and the other follows Wil Parke (an outlier—one who is not susceptible to word persuasion and manipulation) and Eliot (a poet) after the baseword has been deployed. At the beginning of the book, the plot jumping is a bit frenetic. The Wil/Eliot storyline is fast-paced and full of action. But you don’t find out why they’re doing what they’re doing until much, much later in the book. So, for me, it was hard to buy into any of it (and, trust me, there’s a lot to buy into). In contrast, the Emily storyline is fun and engrossing, but slow-paced and character-driven. You’re learning about the school, the process, the people. Because the two storylines are so drastically different, the result is that, from one chapter to the next, it almost feels like you’re reading two different books. And, when you’ve finished and can look back retrospectively at the book as a whole, you realize there are several glaring plot holes. Lexicon is part sci-fi and part thriller, with a touch of romance. In other words, this is decidedly not the kind of book to which I would normally be drawn. But it got really good reviews, and I’m a bit of a language nerd (I majored in foreign languages in college). So I gave it a shot. The book’s premise is creative and fun. But now I must remind you of your fabulous introduction, dear reader! Remember how there was austerity and secrecy, but also that little bit of silliness? Guess what? That’s just like the book. The school and the organization and the poets all take themselves very seriously, and you’re supposed to, too. But parts of the book are a little too reminiscent of a cheesy action movie. And when poets are running around yelling made-up words and phrases (“Vartix velkor mannik wissick!” or “Kinnal forset hallassin aidel!”) to get people to succumb to them, it’s hard not to want to chuckle. All in all, I’d say this is a good summer book (for the beach, a plane trip, whatever). There are fun (although not entirely unpredictable) plot twists. It’s a quick read. And, if you’re into languages, it has some fun facts about how your brain compartmentalizes language. The real bottom line: I want to attend the school. It seems awesome (in a creepy, scary way). Who should read it: my friend Isaac Rosenberg (only because he makes a cameo appearance as a character in the book); my dad (i.e., people who are into both languages and thrillers). 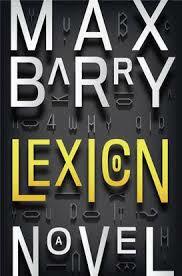 This entry was posted in Rating: 3/5 and tagged Book review, Books, Lexicon, Max Barry, Tower of Babel. Bookmark the permalink.